The so-called “Bunkers” at Auschwitz-Birkenau, two former farmhouses just outside the camp’s perimeter, are claimed to have been the first homicidal gas chambers at Auschwitz specifically converted for this purpose in early 1942. In this examination of a critical component of the Auschwitz extermination legend, the indefatigable Carlo Mattogno has combed tens of thousands of documents from the Auschwitz Construction Office and has analyzed a plethora of eyewitness statements. Debunking the Bunkers of Auschwitz shows how camp rumors of these two alleged homicidal gas chamber buildings have their roots in two innocuous delousing facilities built in 1942 to save lives. Resistance groups within the camp turned these rumors into black propaganda, which was transformed into “reality” after the war by historians relying exclusively on questionable testimonies while ignoring any other evidence, including the extensive documentary evidence from Russian archives unavailable before 1990. Mattogno shows how these historians uncritically and selectively embraced whatever fit into their preconceived notions, while excusing or glossing over the many inconsistencies, contradictions, absurdities and impossibilities of these testimonies. 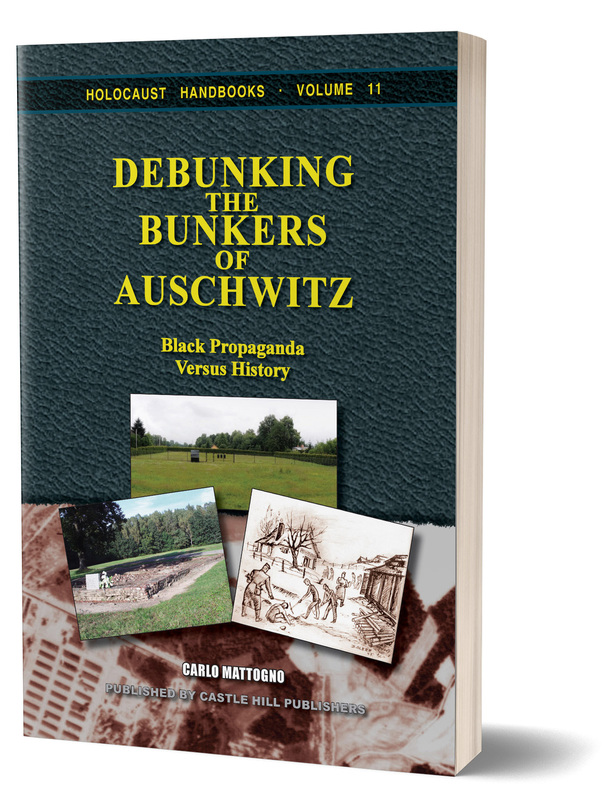 Based on solid evidence, including air photos taken in 1944 and on-site archaeological considerations, the author’s conclusion is inevitable: the Auschwitz “Bunkers” never existed – they have always been nothing more than propaganda bunk. 2nd revised edition, 292 pages. Format: pb, 6"×9", 73 illustrations, bibliography, index. First posted on CODOH: Feb. 1, 2016, 7 p.m.